aww that made me nostalgic. I at times do feel sad that kids these days won't get to experience the simple joys that we had. Ah, what a blast from the past! Buddhi ke baal, and Gold Spot, and Rooh Afza mixed with cold milk in summer evenings. :) It's sad to see the decline of some cultural memes we once held so dear, but I suppose it's inevitable. What remains, for sure, is nostalgic value. Aww...this post did take me back in time. 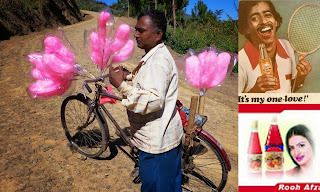 I still indulge in 'buddhi ka Baal' aka candy floss that is sold in school fun fairs. Oh but having it from the street vendor back then was more fun! Its a pity kids these days don't have these simple pleasures to indulge in. Roohafza and Goldspot were also such treats! Lovely reminiscing. You have stirred up nostalgia with this beautiful post.Yes many of the simple joys a generation experiences vanish and give way to new fads or choices for the next one. Apart from budhi ke baal , I still remember those chattar mattar, sweet churan. black namak ,jhal muri which we used to have during our school days.